Aldana « They Said What? 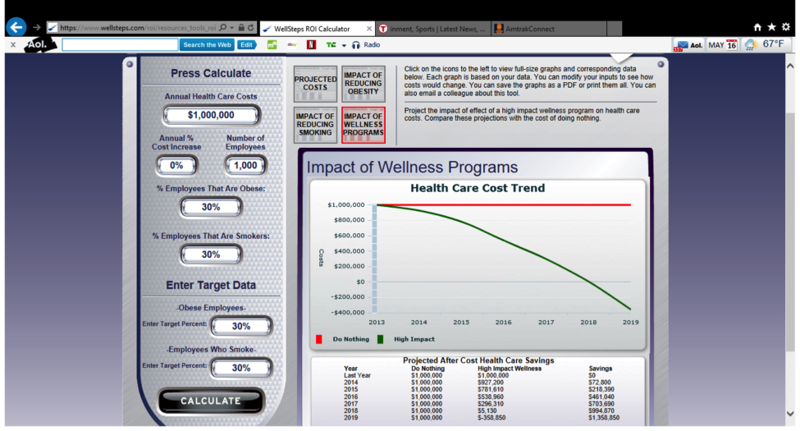 Wellsteps ROI Calculator . You input your number of employees, health spending, and goals for obesity and smoking cessation. 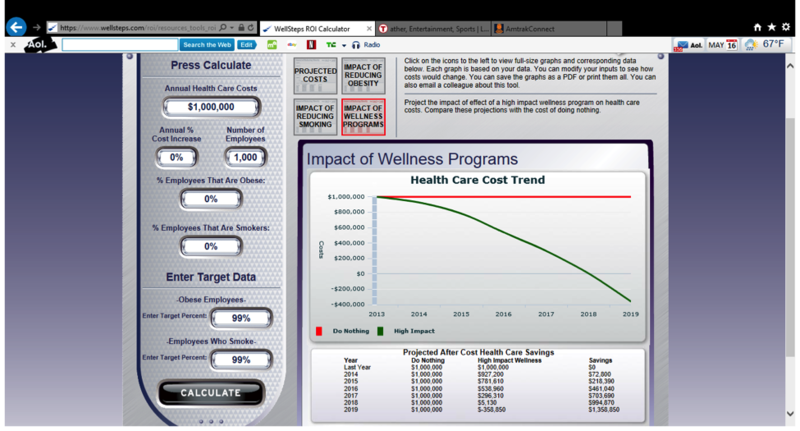 The calculator will tell you how much money you can save through the Wellsteps program. In the first example above, your model calculated massive savings even with no change in obesity and smoking. 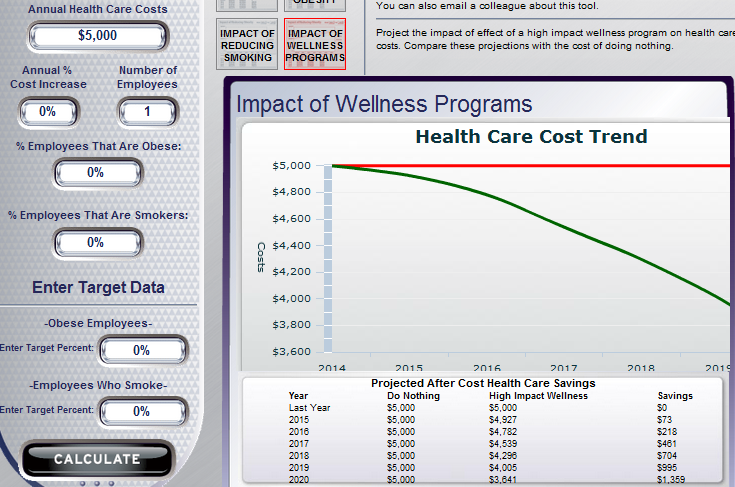 In the second example, your model calculated the same massive savings even with a huge increase in obesity and smoking. 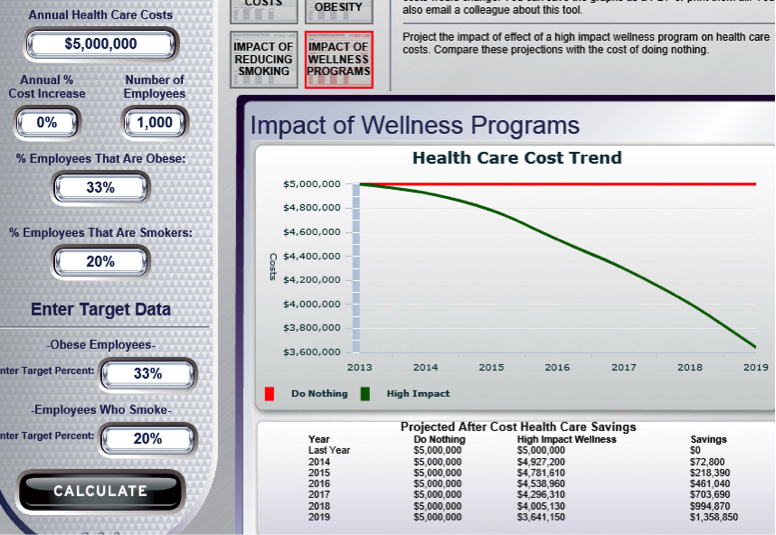 It seems that no matter what smoking and obesity data we enter once we factor out inflation itself, your ROI calculator reduces healthcare costs to a level below zero by 2019. How is this possible? Shouldn’t a spike in smoking and obesity rates from 0% to 99% increase healthcare spending rather than reduce it? Your May 2014 email blast, sent out a few days after The Health Care Blog exposed your ROI model as being invalid, says your model is supported by “every wellness ROI study ever published” (a step up from being “research-based” on a “body of evidence” as your website says). We recognize that asking you to list “every wellness ROI study ever published” would be burdensome, but could you direct us to just one study that says increasing smoking and obesity can improve workforce health and/or reduce healthcare costs to below zero? Does “every wellness ROI study ever published” include the RAND studies in Health Affairs that have found negative ROIs? How are you able to “guarantee” this ROI, since it is impossible to reduce spending to a negative number? Since you’ve known that the Wellsteps ROI Calculator is invalid since this fact was pointed out to you in October 2013 and you have updated your model twice since then, how come you have elected to continue to overstate savings by a mathematically impossible figure? You lead your marketing blast by saying that “11,000 brokers and consultants” have used this ROI model? Are we the first of those 11,000 people to observe negative savings? Do you see any irony in publicly accusing one of the principals of this website, Al Lewis, of acting like a “tobacco executive lying to Congress” when even tobacco executives wouldn’t claim that smoking reduces healthcare costs like your model says it does? Where in your “ROI Calculator” can I find the ROI? ANS: Their ROI Calculator doesn’t calculate an ROI so there was no point in even asking them to answer this question. The good news about Wellsteps is that NASA employees don’t have to worry about job security because these people are not rocket scientists. Actually, we ran every combination of data from a reduction of 99% in smoking and obesity rates to an increase of 99% in smoking and obesity rates. Some of that data might have been “false” (whatever that means), but the result was always the same: $1358.85 in savings/employee by 2019. Here are two more examples, this time using the default numbers they recommended. The first is @$5000/employee in annual costs, with no change in smoking or obesity. The second is @50,000/employee. The answer is still the same. How come, regardless of what assumptions get entered (and we have now entered many vastly different combinations of cost and success), the answer is always that by 2019, you save $1,358.85 per employee once you zero out inflation? Would you now admit that entering $5000/employee in spending and 33% obesity and 20% smoking (the national averages) constitute, in your words, “valid estimates that work best” ? Following my exposé, your model no longer allows a user to enter increases in smoking and obesity. Is this to prevent users from figuring out that even if the rates of smoking and obesity increase, the math underlying your model based on “every ROI study ever published” will still show a reduction of $1,358.85/employee in 2019? 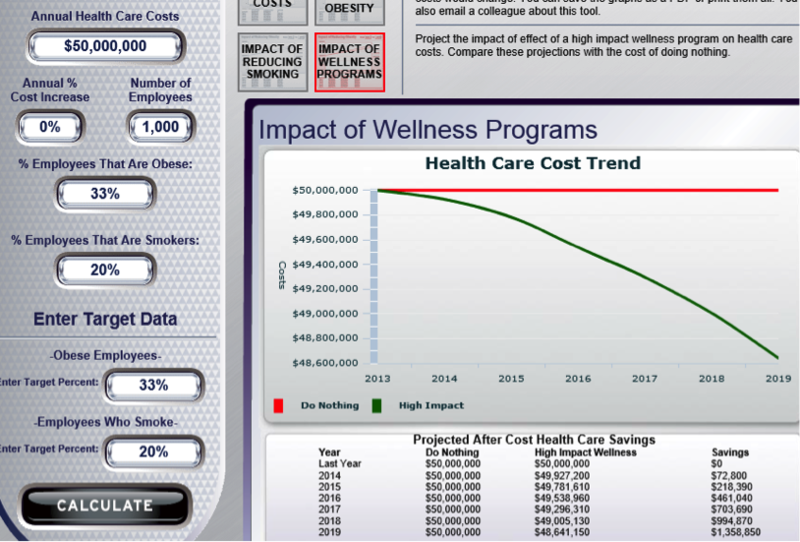 How come the model shows that very same $1358.85 (now finally “rounded” to $1359) potential savings from reducing obesity and smoking even if I start out with no smokers or obese employees? Somehow they reported costs going up and down at the same time. Even wellness industry math doesn’t allow that.